Rosé skeptics must surely be convinced by now that this is more than a passing fad, with the bourgeoning popularity of rosé and increasingly diverse range of styles with winemakers from divergent regions pursuing worldwide consumer demand. However, the rose euphoria is being exploited by opportunist (parasitical) wine marketers with a flood of rosé coming on to the market, a large percentage of these wines are made as an afterthought and do the rose movement an injustice. Alas, my choice of “rosé of the year” is intentionally from a region and producer that grows grapes specifically for rose and has been perpetually dedicated to, if not synonymous of this dry style of wine – Provence. I have been tracking the progression and continual improvement of Domaine Grand Cros and Cotes de Provence vigneron, Julian Faulkner (a Canadian), for several years now and the wine quality; integrity of style and commitment to sustainable viticulture and farming is commendable. For many years my benchmark rosé from Provence has been Domaine Tempier, perhaps also Domaine Ott and whilst both continue to produce wines of great character, the vibrancy, pureness of expressive fruit along with a mélange of spices augmented by invigorating acidity in the Grand Cros wines sets a new standard both in style and quality. I consider Faulkner’s L’Esprit Rosé comparable to any serious aromatic white wine, although as much as I want wine consumers to take dedicated rosé producers seriously, serious is perhaps the wrong word or wrong connotation and maybe genuine is more appropriate for a wine that is both symbolic and tactile of the joie de vivre and radiant Mediterranean climate. Above all, I applaud Faulkner for bottling a large part of his production in Screwcap Closure, guaranteeing his wines retain the freshness and quality that he worked so hard to achieve in the vineyard and winery. Bravo! Le Grand Cros was purchased as an existing vineyard property by Canadian Hugh Faulkner and his wife Jane in 1989. Jane has been largely responsible for restoring the impressive manor and the day to day running of the property. She also cooks the best chicken and chanterelle mushroom casserole in all Provence! Their son Julian took over the running of the vineyard in 2000 after completing a master’s degree on vineyard management in Bordeaux and has recently taken over the reins of running the entire business including marketing and the launch of an affordable, immediately approachable range of wines under the “Jules” label. Julian has a deep respect for the traditional ideologies and terroir of the region however, applies a contemporary and pragmatic approach to environmentally conscious viticulture and winery production with a sustainable approach for property in its entirety. Located in the centre of the Var, essentially in the heart of Côtes de Provence appellation (the hills), the vineyard is typically planted with red varieties cabernet sauvignon, syrah, grenache, cinsault, carignan and the indigenous tibouren with rolle (vermintino) and semillon for whites, surrounded by the requisite olive groves and pine trees. 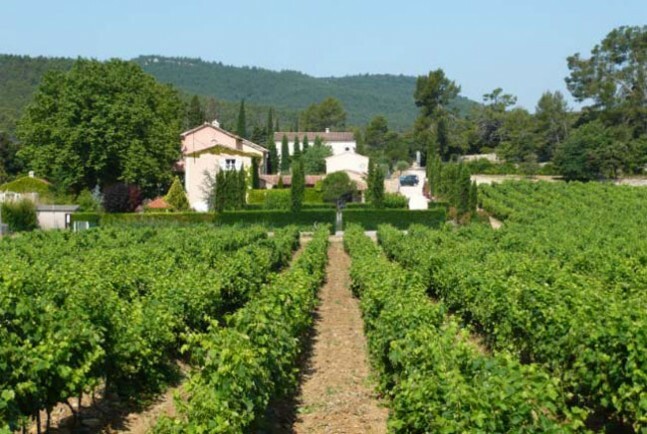 Situated in the commune of Carnoules, about 1 hour drive (60 km) North West of Saint-Tropez, Le Grand Cros has 24 hectares of contiguous vineyards in the foothills of the Massif des Maures, the surrounding hills creating a unique micro-climate that protects the vines from frost and hail. Above the limestone substrata the clay and calcareous soils are poor and rocky with good drainage to cope with the abundant winter rainfall, well, it used to be abundant! 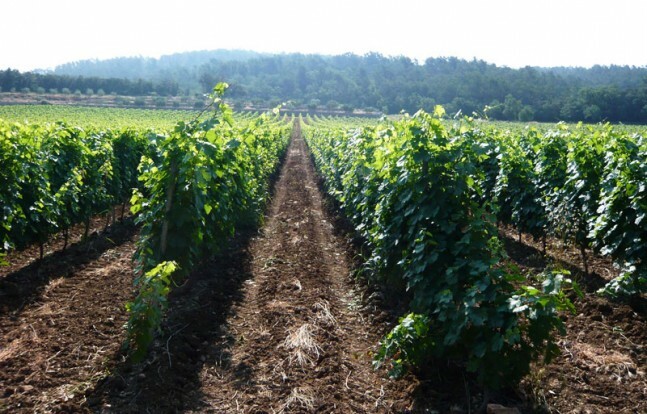 The vines endure the fierce mistral winds and intense, radiant Mediterranean climate, as one can envisage of Provence, the picturesque, enchanting countryside yet, arid and challenging conditions – ideal terroir for wine of true character. Julian has steadily worked towards the entire property following the Terra Vitis, a charter that guarantees environmentally sustainable practises and the vineyard, although I have not seen him burying any cow’s horns yet. According to Julian, the 2007 growing season was similar to every vintage since 2000, hot and dry with water stress was getting progressively worse – clear signs of global warming. That said, you might recall 2007 was a miserable summer in Europe with record flooding in the UK, although the south east of France did not get any of that rain, accept a little mid-harvest. He reports, much to his relief, that 2008 has seen more rain than any year since 2000 so their water table is back to where it should be. Alas, 2007 is a vintage of two parts, the first part of the harvest with low yields, high sugar, high concentration, great for older vines but unbalanced for younger vines that struggled with the water stress. The second half, after that spot of rain, maturation happened at a more natural pace, less alcohol, more juice, and all good. Grenache, cinsault and syrah are vinified separately with an initial cold soak and maceration on the grape skins to extract colour and flavour, then pressing of the grapes with separation of the free-run juice from the pressed must. The juice is cold settled with temperature controlled fermentation at 17-18°C in stainless steel with malolactic fermentation blocked, retaining crisp structure and edgy acidity in the wine. Julian has three levels of wine, the ‘L’Esprit’ range perhaps the core wines, with the ‘Nectar’ range, nonconformist and an outlet for experimentation of perhaps more new world techniques. The “Jules” range brings both flexibility and affordability to the equation. The most encouraging sign I have seen in the evolution of Grand Cros is the departure from using oak with Julian commenting to me on my last visit that he envisages using very little small or new oak in his wines now. I am great supporter of this ideology with an emphasis on more elegant wines that are unadulterated by dominating oak and more expressive in their ‘sense of place’. This may well be at the expense of Parker style and the credulous points worshippers however; there is a more powerful movement out there, people who want to drink real wine with individual character. An alluring pale pink colour with a twinkle of amber or partridge eye if you like. Quintessential Provence grenache-dominant fragrance, with its perfume of raspberries and wild strawberries amongst summer fields – like walking through Provence bushland on a hot day with the air redolent in straw, dried herbs with a distinct smell of sage and lavender. There is a very attractive spice-box and black pepper element amongst the sweet red berry fruits and nuances of ripe peach and nectarine. A lively, crisp-crunchy palate entry, immediately tangy intense sour raspberries, pomegranate and redcurrant accelerating with mouth-watering freshness with squeezed lemon-juice and grapefruit-like acidity and pickled ginger spiciness. There is more evident succulence and sweetness of fruit on the mid-palate with plenty of sweet strawberry, juicy peach and nectarine flavours yet turning savoury with wild thyme and sage seasoning and a pleasant bitternut twist towards a tantalizing dry farewell, echoing sweet-sour raspberries and strawberries amongst exhilarating lemony acidity. A wonderfully vibrant, refreshing and complex wine redolent of summer, and dangerously drinkable! Hello! – Serve well-chilled, like a riesling; warm rosé is not a good look! I cannot think of a more versatile and appropriate wine for congenial, banquet style dining, particularly spicy Thai, Peranakan, Penang, or Straits-Chinese cuisines with the communal sharing of dishes and kitchens that inevitably bombard you with dishes in illogical order. It is equally versatile with sushi and sashimi and with an element of predictability and association of colour, is perfect with salmon, ocean trout and tuna. Even more obvious, practically the entire Provence summer recipe book, if not at any hour of the day as the perfect all round lubricant for compotation, no matter where you are. Rosé is at its most evocative in the warmer months and climates, as I put it, “the mood before the food” is the overriding stimulus. Practically all rosé is intended to be consumed young, within a year or so of bottling however Grand Cros L’Esprit does develop quite nicely over the short term, indeed I would rather drink it with 6 months to a year bottle age on it, particularly the Screwcap closure bottling. It is absurdly inexpensive for the quality and sheer drinkability, a paltry 6 Euros a bottle at the cellar door. There will of course be extortionate sin taxes in country you purchase it however, I can say with complete confidence, wherever you come across Grand Cros wines, they will represent outstanding value for money. Looking for Asia importers – tell your local wine merchant to get their act together and stock more rosé, the locals should be drinking it and the expats want to drink it! Needless to say, Provence is a very large region with infinite number of tranquil, charming villages and gastronomic destinations however, if you want to avoid the tourist traps of St-Tropez and Cannes, head for the hills. We enjoyed a recent stay near Le Muy, about 40 minutes drive north at a vineyard called Chateau du Routet, the villa accommodation certainly authentic if not a bit rustic, and the owners are genuinely friendly, a plus in France!